One Way To Have An Affording Thanksgiving: A Potluck Thanksgiving! You are here: Home / Savings Tips / One Way To Have An Affording Thanksgiving: A Potluck Thanksgiving! Making a Thanksgiving meal for a large group of people can be very costly. The turkey alone typically starts around $12 and goes up depending on weight, whether it is fresh or frozen, and several other factors. In fact, the average cost of a Thanksgiving meal for 10 people is $50.11, largely depending on how many side dishes and desserts you prepare in addition to your turkey. If you are feeding an especially large group of people you may be wondering how you can save money on your Thanksgiving dinner. 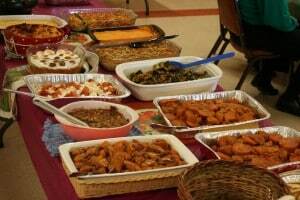 One easy way to distribute the cost of the meal is by hosting a Potluck Thanksgiving dinner! We absolutely love the idea of a potluck Thanksgiving. With a potluck meal, everyone brings a dish. This is great for many reasons. As we mentioned, this helps distribute the cost among several people. Another great benefit is that you get to try new recipes that you would never have known about, but end up loving! This enables you to broaden your food horizons. The potluck Thanksgiving idea works great for families, but it also works out for Friendsgiving meals! If the term Friendsgiving has you scratching your head, allow us to explain. Friendsgiving is a relatively newer concept, where friends gather together together (typically before or after Thanksgiving) to share a Thanksgiving feast with one another. Part of the beauty of Friendsgiving is that you spend it with friends (AKA people you actually choose to be around simply because you like one another). At a Friendsgiving meal, you do not have to deal with the drama sometimes associated with family gatherings (and if that does occur at your Friendsgiving, you may want to reconsider the friends you’ve chosen!) Anyway, a great way to host a Friendsgiving meal is by making it a potluck. Let everyone bring a dish to share.